Award-winning for his fresh approaches to night-time, light-painted photography, Lorran Meares has exhibited in numerous galleries and prestigious museum exhibitions nationally and internationally. The Museum of New Mexico mounted a traveling solo exhibition of his landscape photographs from which selections were featured in the America’s Priceless Heritageexhibition at the Smithsonian Institution, Washington, D.C. In 1993, the Sierra Club published Sacred Places: Native American Sites featuring Meares’ unique interpretive images with a forward by Pulitzer Prize winning Kiowa author, N. Scott Momaday. Archetypal, mystical interpretations of body, mind and spirit evolve co-creatively in the context of sacred landscape in dazzling color or black and white, in immersive 3D stereoscopic installations as well as traditional two-dimensional formats. 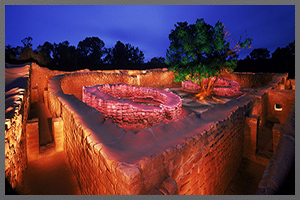 Meares’ “Sacred Places” series light-painted photographs showcasing sites across the country are available for purchase as single images or as 3D stereoscopic portfolios. Call or e-mail for portfolio image prices or to schedule a private consultation. Unique, co-creative personal or professional photographic projects are welcome.